What's next? The Beatles on iTunes? 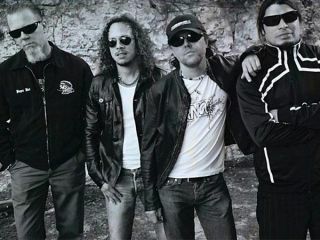 Metallica: "To forgive is divine"
A much-publicised legal brush with Napster in 2000 helped build Metallica's moaning technophobe-reputation. And more recent Death Magnetic altercations did nothing to tarnish it. Now, according to a mailout, Metallica have gone full circle by shoving their entire back-catalogue on Napster. Power to the people! Of course, it's not really power to the people (if the people are the illegal-downloading public) because the only similarity between 2000's Napster and today's is the logo.We did a quick search of the download service and found the following: "We are still working on getting music by Metallica. We get new artists and music everyday. Check back soon". Oh dear. Still, if Metallica are finally getting into bed with the one-time P2P pirates, we have to wonder what's next? The Beatles on iTunes? Get on with it.